Pigs Pigs Pigs Pigs Pigs Pigs Pigs stormed into The Hare & Hounds. The five piece Geordie rockers packed the room to the rafters and not a big bad wolf was in sight. 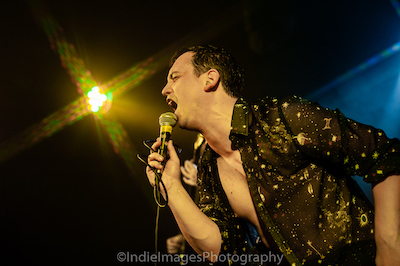 With the heat of the room rising, front man Matt Baty shouted to the back regarding sound distortion "Have you got any tape as this keeps slipping and causing impromptu solos?" This all unknown to their adoring fans who were having such a good time they hadn't even noticed.